Enjoy! The Elder Scrolls V: Skyrim is out on 11 November! Along with Sir Gawain and the Green Knight, which I mentioned yesterday, I have now also added the Breton lais of Marie de France to the website. Here’s a quick run-down of the full contents that are online – you can also get it all of Marie de France’s lais as an eBook for easier reading. And if you’re interested I have written a short story based on The Lay of the Were-Wolf, called Bisclavret (The Werewolf). In the Medieval History and Literature section of this site I’ve recently posted the full modern English translation by Jessie L. Weston of Sir Gawain and the Green Knight – a rather fine poem, and a good translation. After the siege and the assault of Troy, when that burg was destroyed and burnt to ashes, and the traitor tried for his treason, the noble Æneas and his kin sailed forth to become princes and patrons of well-nigh all the Western Isles. Thus Romulus built Rome (and gave to the city his own name, which it bears even to this day); and Ticius turned him to Tuscany; and Langobard raised him up dwellings in Lombardy; and Felix Brutus sailed far over the French flood, and founded the kingdom of Britain, wherein have been war and waste and wonder, and bliss and bale, ofttimes since. And in that kingdom of Britain have been wrought more gallant deeds than in any other; but of all British kings Arthur was the most valiant, as I have heard tell, therefore will I set forth a wondrous adventure that fell out in his time. And if ye will listen to me, but for a little while, I will tell it even as it stands in story stiff and strong, fixed in the letter, as it hath long been known in the land. Weston’s translation is clear for the modern reader, but retains the power of the original poem (although in prose format). In 1281 Kulbai Khan (he of the pleasure dome), tried to invade Japan and failed miserably, his fleet being destroyed by the divine wind (kamikaze). The attempted invasion by 100,000 Mongols and its defeat is a legend in Japanese history, so I’m sure the news of the discovery of a Mongol shipwreck from this era must have been big news in Japan. The scientists from the University of the Ryukyus in Okinawa say they’ve found a 12-meter-long section of a ship’s keel, which could have been as long as 20 meters. Though some 4,000 artifacts allegedly belonging to the smashed fleets have been recovered from the sea, this is the most complete archaeological find related to the invasions. Was Coleridge alluding to the war against Japan? Part of my story Hell has its Demons is set in the fictional Abbey of St. Brett’s. Therefore I’ve had to research monastic life a fair bit. I have just added a page to this site on Abbey officials. I hope you medieval history fans find it useful! In my recent posts about the best and worst Medieval people I have been remiss in not mentioning any women. 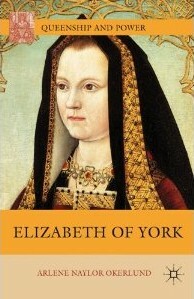 So to balance that out only slightly, here’s some information about an upcoming biography of a powerful Medieval lady: Elizabeth of York, mother of Henry VIII and grandmother of Elizabeth I. This book tells the story of the queen whose marriage to King Henry VII ended England’s Wars of the Roses and inaugurated the 118-year Tudor dynasty. Best known as the mother of Henry VIII and grandmother of Elizabeth I, this Queen Elizabeth contributed far beyond the act of giving birth to future monarchs. Her marriage to Henry VII unified the feuding houses of Lancaster and York, and her popularity with the people helped her husband survive rebellions that plagued his first decade of rule. Queen Elizabeth’s gracious manners and large family created a warm, convivial Court marked by a rather exceptional fondness between the royal couple. Her love for music, literature, and architecture also helped inspire England’s Renaissance. Want to read more posts from Praeter Naturam, don’t forget to sign up to the RSS Feed, or get an email subscription. Innocent IV – the implacable enemy of Frederick II. Innocent’s political ambitions tore Italy apart and prevented Frederick from fulfilling his (possibly enlightened) political ambitions. John of Gaunt – the younger brother of the Black Prince, and terrible as a military commander (although a stickler for the rules of chivalry and not bad in single combat), and venal and worse as a politician and stand-in for his dotard father Edward III. Bernard Gui – the famous Inquisitor and author of Practica Inquisitionis Heretice Pravitatis is an easy target as a hate figure – the archetypal oppressor and symbolic of what is always wrong with the Middle Ages – dogmatic, cruel repression. His reputation is cemented by being the baddie in Umberto Eco‘s The Name of the Rose. William the Conqueror – gave us an Anglo-Norman aristocracy, French speaking until the fourteenth century to rule over us. Would England have been less riven by class divide if the English hadn’t been subject to a French ruling class for so long? Henry V – a great tactician on the battlefield and a leader of men, but was his ambition to conquer France really a good idea? Consigned England to humiliating defeat at the hands of the French, and the disastrous Wars of the Roses. A bit controversial maybe? I’d love to hear your comments. There’s apparently going to be a film version of a little known book by an unknown writer out soon that for some reason is causing a bit of excitement – The Hobbit by J. R. R. Tolkien I think it’s called. Some fella by the name of Jackson is directing. Anyway here’s the trailer for it. I’m really not sure about those hairy feet. Medievalists.net discusses evidence for Scottish Medieval Football – although is this any real surprise? Football was around for a long time in the Middle Ages. This is from Matthew Paris’s Chronica Majora for 1254. This time a phenomenon seen by monks from his own abbey! Fits quite well I think with the idea of Cloud Ships that I blogged about previously. About midnight of the day of our Lord’s circumcision, the moon being eight days old, and the firmament studded with stars, and the air completely calm, there appeared in the sky, wonderful to relate, the form of a large ship, well-shaped, and of remarkable design and colour. This apparition was seen by some monks of St. Alban’s, staying at St. Amphibalus to celebrate the festival, who were looking out to see by the stars if it was the hour for chanting matins, and they at once called together all their friends and followers who were in the house to see the wonderful apparition. The vessel appeared for a long time, as if it were painted, and really built with planks ; but at length it began by degrees to dissolve and disappear, wherefore it was believed to have been a cloud, but a wonderful and extra-ordinary one. Day of our Lord’s circumcision – actually New Year’s Day, January 1st – as this was eight days after Christ’s birth. St. Amphibalus – a Christian pries sheltered by Alban, who was converted by Amphibalus. St. Alban was then martyred protecting Amphibalus. Matthew is indicated that the monks were at the Abbey’s satellite priory of St. Amphibalus at Redbourn, which is where the Saints remains were originally found before being moved to a shrine in the Abbey Church. I wonder what this vessel could have been. It is interesting that Matthew does not try to explain it any spiritual one – in the end he puts it down to being just a very remarkable cloud.